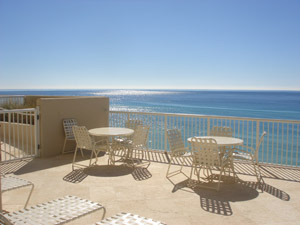 Strategically located on the west end of Panama City Beach close to many attractions, dining and shopping, Palazzo is a more intimate resort property consisting of only 129 units � all with breathtaking gulf-front views. Palazzo offers elegant 1, 2 and 3 bedroom units with an upscale finish that are sure to impress even the most discriminating buyer. Features include 9-10 foot ceilings, crown molding, granite countertops in the kitchen and Whirlpool Gold appliances as a standard. 1 bedroom/2 bath (with bunk area) 1,026 Sq. Ft.
2 bedroom/2 bath (with bunk area) 1,345 Sq. Ft.
3 bedroom/3 bath (interior unit) 1,475 Sq. Ft.
3 bedroom/3 bath (east end unit) 1,849 Sq. 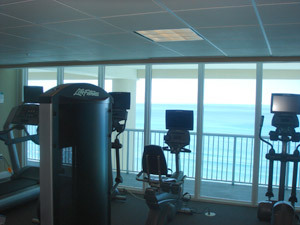 Ft.
3 bedroom/3 bath (west end unit) 1,874 Sq. 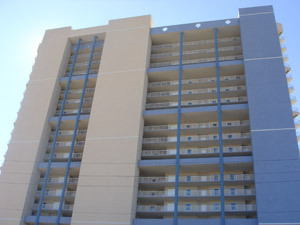 Ft.
Palazzo Resort Condominium is located at the site of the former Island Breeze Motel (directly across from Boar's Head Restaurant) on the west end of Panama City Beach. It is approximately 1 mile west of Highway 79 on Front Beach Road. Palazzo Resort Condos are close to Gulf World, the County Pier, Pier Park and just 20 minutes from the Silver Sands Outlet Shopping Center in Sandestin!